This float is an invaluable scuba fishing tool for solo divers who need to carry along additional equipment and accessories. 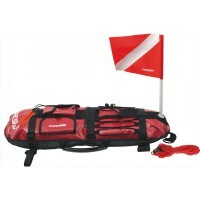 Red in colour for excellent visibility, it uses two casings: an outer skin made of abrasionresistant material ensures excellent protection for the two inner inflatable chambers, which are white. Its dimensions, 80x30x15 cm, make it possible to bring along three guns and two spare spears, which are stored safely in a bottom compartment fitted with adjustable velcro straps and elastic rings. A mesh cover makes the bottom abrasion-proof and ensures effective drainage so that the buoy retains its light weight at all times. Its design ensures minimal drag and smooth sliding. The upper part is fitted with multipurpose pockets and a big expanding container for bigger items and spare parts. A mesh bag made of adjustable elastic straps will carry additional objects. A zipper along the centre gives access to the two air tubes, which are kept separate for fail-safe buoyancy. A casing for the pole of the flag required by regulations is provided in the centre of the front section of the float. Two well-finished handles facilitate transportation of the loaded float off the water. Also red, the line is about 20m long and is fitted with two plastic snap hooks.